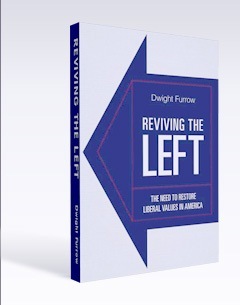 Posted by Dwight Furrow in Dwight Furrow's Posts, Ethics. Capitalist theory asserts that businesses in a competitive environment will follow ethical norms and be honest, fair, and diligent, if they aren’t ethical, consumers will not do business with them. Thus, consumer protection legislation is unnecessary. Whatever modicum of plausibility this view had should have been thoroughly shattered by recent experience—but the theory persists nevertheless. So how would this theory account for the behavior of the European airline Ryanair? RYANAIR HAS appeared in the bottom 10 of an “ethical ranking” of 581 companies, based on environmental performance, corporate social responsibility and information provided to consumers. … Ryanair is ranked 575 on the latest list, just ahead of Occidental Petroleum, US tobacco company Phillip Morris and oil giant Chevron. At the bottom is Monsanto, chiefly known for genetically modified foods. The company prides itself not only on being perceived as having no social conscience, but as having a reputation for screwing its customers as systematically and mercilessly as possible. Which other airline’s CEO would announce that he wanted to charge passengers to use the toilet as a publicity stunt? Clearly, Ryanair thinks that this reputation is a money spinner for them (it is quite deliberately cultivated), and they have indeed made quite a lot of money. But why (if they are right) would a reputation for shafting your customers be a commercial asset for a consumer-oriented business in a relatively competitive sector? The standard economic account doesn’t seem to provide much insight. Help me out here. Apparently, there are plenty of customers out there who think being disreputable and unscrupulous is a sign of a good business that can get you to your destination cheaply and safely. Morality is a sign of weakness, inefficiency, and woolly thinking so Ryanair is their kind of outfit. There is a market for everything; ain’t capitalism grand? Posted by Dwight Furrow in Culture, Dwight Furrow's Posts, Technology. For those of you listening to your Ipods, updating Facebook, tracking 3 Twitter conversations while finishing your defense of the Ontological Argument, here is something else to do: read the Encyclopedia Brittanica’s blog posts on controversies about multitasking. The ability to multitask is one of the essential strengths of our infinitely amazing brains. We wouldn’t want to lose it. But as neurobiologists and psychologists have shown, and as Maggie Jackson has carefully documented, we pay a price when we multitask. Because the depth of our attention governs the depth of our thought and our memory, when we multitask we sacrifice understanding and learning. We do more but know less. And the more tasks we juggle and the more quickly we switch between them, the higher the cognitive price we pay. The problem today is not that we multitask. We’ve always multitasked. The problem is that we’re always in multitasking mode. The natural busyness of our lives is being amplified by the networked gadgets that constantly send us messages and alerts, bombard us with other bits of important and trivial information, and generally interrupt the train of our thought. The data barrage never lets up. As a result, we devote ever less time to the calmer, more attentive modes of thinking that have always given richness to our intellectual lives and our culture — the modes of thinking that involve concentration, contemplation, reflection, introspection. The less we practice these habits of mind, the more we risk losing them altogether. I guess this means that if you are a contemplative sort with a penchant for profundity you should be careful about the multitasking. But if daytime soaps and reality shows are your thing, you might as well be twittering. I was unfortunately unable to watch Obama’s State of the Union Speech. I will have to watch it tomorrow. This is a crucial time in his presidency and he needed to be at his best—and the immediate response suggests to be that he was. I care what happens over the next few days and weeks. When the likes of Bayh, Lincoln, Ben Nelson, Landrieu, Holy Joe, and Rahm start saying, “let’s go slow and not try to do too much,” will the President listen to them? When Congressional leaders ask the President to give them leadership and direction on health care, will he provide it? When they try to hollow out financial regulation, or destroy the bank tax, will the White House go along? When Lisa Murkowski tries to attach her egregious rider to an appropriations bill to stop EPA from regulating climate change, will Obama threaten a veto? When the going gets tough in Washington, will Obama take to the hustings and campaign as if his Presidency and the nation depend upon him winning (because it does)? Obama has done a lot of good things—especially the stimulus package which has saved jobs and stabilizing the banking system, which has saved a whole lot of jobs. He has made a few mistakes—but then he has the most difficult job in the world. Who wouldn’t make mistakes? The question is will he provide the kind of extraordinary leadership we need in this extraordinary time. Or will he succumb to the inside-the-beltway inertia that swallows any good idea and regurgitates it as patronage for oligarchs. Posted by Ian Duckles in Art and Music, Uncategorized. Continuing on my theme of philosophically interesting comics books, I intend to devote this entry to an examination of what people normally associate with the form: the cape and cowl style superhero. Rather than discuss the genre generally, I want to focus on a specific series, The Brave and the Bold volume 3, issues 27-30 written by J. Michael Straczynski with art by Jesus Saiz. 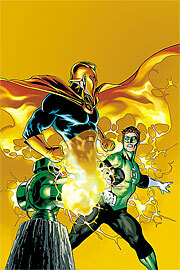 The Brave and the Bold is published by DC comics and features team-ups between various characters in the DC Universe. I will examine the four most recent issues of this series (still available at your local comic book shop) because the creative team behind the book is really doing an amazing job. Each of these four books is an out of continuity one-shot (meaning that each book tells a self-contained story that can be understood on its own without having to have read other comic books or even be familiar with the characters in the book), which makes them a perfect starting point for people who are new to the comic book medium. Each of the four books features a team-up between a well-established superhero and a more obscure character(s) from the DC Universe. What sets these books apart from more generic super-hero comics (not that there is anything wrong with that) is the way Straczynski uses these team-ups to explore themes and issues that transcend the normal fare found in comics. I want to briefly discuss each of these books in turn. As a quick note, I won’t be discussing the art in these books but suffice to say Saiz does an outstanding job. 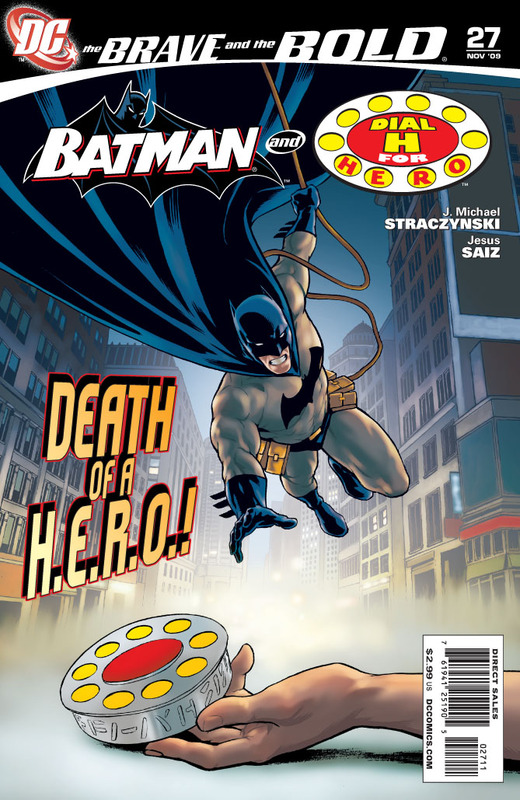 Issue #27: Batman and Dial H for Hero. At this point, Batman needs no introduction, but Dial H for Hero is an old-style rotary phone dial that turns the user into a superhero when he or she dials the letters H-E-R-O. In this story, the owner of the dial is visiting Gotham City (Batman’s hometown) when it is stolen by a petty thief named Travis Milton. Milton uses the dial and is transformed into a Superman like character named The Star. When the Star rescues a window cleaner who has fallen off the scaffolding, Travers realizes that his new-found powers provide him an opportunity for redemption and an escape from his life of crime. Of particular interest is the way Strazcynski uses this set-up to explore the nature of heroism in comic books, and he suggests what might motivate someone in this fictional world to put on a costume and start fighting crime. The psychological profiling of superheros and villains has been done (often poorly) by many in the wake of Alan Moore and Dave Gibbons Watchmen, but Strazcynski is able to give a more optimistic spin on this well-worn trope. Issue #28 begins when the Flash (the fastest man alive) breaks his leg while inadvertently traveling back in time to the Battle of the Bulge. 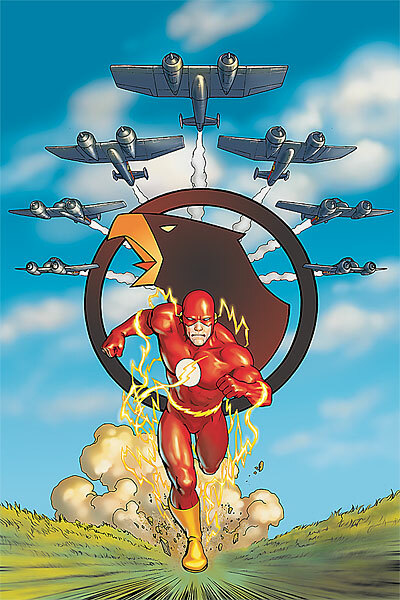 Because he needs to run at super speed to return to his own time, the Flash is trapped in the past until his leg heals. While there he encounters the Blackhawks (a multi-national group of WWII flying aces) who themselves have been accidentally dragged into the battle when they were ambushed while on R&R in Belgium. In the DC universe, the general criterion that distinguishes heroes from villains is that heroes do not kill while villains do. This creates a dilemma for the Flash as he finds himself in the middle of a war, teamed up with an elite band of soldiers. The way in which the Flash resolves this dilemma provides the core of the story and the way in which Straczynski uses this framework to explore notions of heroism and the obligations of citizens during wartime is fascinating. Issue #29 one again returns to Batman, this time teaming him with an obscure 60’s counter-culture superhero: Brother Power the Geek. Straczynski uses this match up to contrast the values of the 60’s (particularly the hippies and the counter-culture) with the values of contemporary America. This is a story that has already been dealt with in many contexts, but Straczynski is nevertheless able to find an interesting and compelling take, particularly as he contrasts the ideals of the Summer of Love with America in 2009. Issues #30: My personal favorite of the four and the most obviously “philosophical,” this issue teams the Green Lantern with Dr. Fate. Very quickly, the Green Lantern’s powers come from a ring that is fueled by the user’s will power. Dr. Fate, as the name suggests is a servant of the forces of fate and destiny. 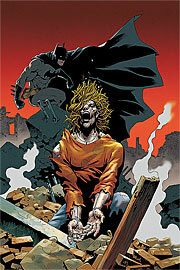 Straczynski uses this team-up to explore the classic philosophical debate of free will vs. determinism. What I particularly appreciated about this book was that, in true philosophical fashion, Straczynski does not provide any answers, but instead raises issues and questions about this topic as he uses these characters to explore many of the different perspectives one can take. This book in particular would work as an excellent way to get students to think about these concepts and some of the issues and consequences of the various positions one can occupy in this debate. Obama’s announcement of a spending freeze for discretionary programs was a surprise. Cutting the federal budget during a recession, when unemployment is high, is a really dumb idea. It turns out that this is not really a spending freeze; it is a budget cap that doesn’t kick in until 2011 and allows the administration considerable flexibility in keeping stimulus and other federal money flowing through the economy. In essence, he is doing what he promised during the campaign—taking a scalpel to programs that don’t work and using those savings to fund programs that do. Despite some of the apoplectic responses in the left blogosphere, this is not a job killer. But it is still not a good idea. The Obama Administration is negotiating with itself here. Republicans will not give him credit for any budget reductions. Obama came into office with the task of changing American’s perceptions of the value of government. Now is the time to convince the American public that government has an important role to play creating jobs when private industry has failed. Instead, by calling this a “freeze”, which is what the Republicans have been calling for, he has reinforced the failed Republican narrative that government is not part of the solution. This is bad economics; it is disastrous social policy. And it sends the wrong message at the wrong time. Moreover, his so-called “freeze” does not include military expenditures which are the biggest source of waste and fraud in the budget. If we need to scrutinize individual programs for their effectiveness, why does Defense and Homeland Security escape scrutiny? The answer is that conservatives would whine if he proposed cuts in these areas. Obama’s tendency to reinforce right-wing ideas continues to disappoint. Posted by Nina Rosenstand in Culture, Nina Rosenstand's Posts, Philosophy of Literature. But it can get worse. How about losing regular bookstores, with new books? A recent CNN report told us that there are now no more regular bookstores in the city of Laredo. And before you start thinking snidely about Laredo, Texas, cowboys, and so forth, just let me remind you that for one thing, reading books used to be a widespread, nonpartisan pastime, and for another, you can’t jump to cultural conclusions based on geographical assumptions. So Laredo has lost all its bookstores, and it seems that other cities will follow. The irony is that it wasn’t even because nobody was buying books in the last remaining mall bookstore—it was a thriving business, but the bookstore chain was looking to save money by closing outlets. Barnes & Noble says it closed the Laredo store as part of an overall strategy to shut down the chain of mall-based bookstores. Even though the Laredo store was profitable, the overall chain was losing money, according to company officials. Some in Laredo fear the lack of a book store will make the city look like an ignorant outpost on the Texas border. “Assuming that we don’t read because we’re Mexican or we’re immigrant or we’re poor, that is not the case,” said Xochitl Mora, the city’s spokeswoman who spearheads the “Laredo Reads” initiative. The publishing industry is in the midst of a revolution. Threats from Internet sites, like Amazon.com, and electronic book devices, like the Kindle, have cut into profits of retail book giants. In addition, bookstores are facing increasing competition from mass merchandisers like Target and Wal-Mart. About 50 to 60 small Barnes & Noble-owned bookstores have closed every year over the last 5 to 6 years, the company said. Rival Borders has also struggled financially amid the tough marketplace. Are we really on the road to a future where owning and reading books is “quaint” and perhaps a little subversive, a little disturbing? Is Ray Bradbury going to be right? Posted by Dwight Furrow in Dwight Furrow's Posts, Education. Early January. Because students don’t have very many claims on their attention, it’s good to send out reading assignments even before school begins. February. Students love all their courses, and are gung-ho about doing well. There’s no reason they can’t earn a grade of “A” in just about every course. This is the time when smart professors really pile on the work. March. Students have come to terms with the fact that it’s going to be darn hard to get all those “A’s” they originally thought would just fall in their laps. The moment calls for triage: It’s time to figure out whether to drop calculus or the course in the history of mirrors. Also, students need more sleep than they’re getting, and the way to fix that is to sleep through the first half of the early morning class. April. It’s too late. Whole lives are doomed. Students will never get into law school with the grades you, the vile, wretched, cruel-hearted professor, have been unfairly giving out. May. The semester ends. Professors never gave students a chance, or considered how hard they tried. The world is stacked against them. What does it matter? There are no jobs out there anyway. June. Whatever happened in the past is over and done with. Time to forget everything and party like hell. NOTE: Summer inevitably passes. With fall, the Sisyphean climb resumes. June seems very far away. For anyone who takes democracy seriously, today was not a good day. It looks like health care reform is dead for now, held hostage by a minority of 41 Senators who see fit to abuse Senate rules to prevent majority rule. And the Supreme Court in a 5-4 ruling held that restrictions placed on corporate campaign contributions are unconstitutional. Corporate influence on campaigns, already substantial, will now know no limits. Politicians will be wholly owned subsidiaries of Big Pharma, Big Banks, and Big Oil. The ruling is philosophically absurd. Justice Kennedy, writing for the majority, claimed that restrictions on campaign donations by corporations is a unconstitutional abridgement of their freedom of speech. But corporations are not persons. Human beings have rights such as freedom of speech because we have desires, thoughts, and the self-awareness to care about their expression. Rocks, coffee cups, and footballs don’t—and neither do corporations. The nonsense about corporations being persons is a legal fiction devised solely for economic purposes in the late 19th Century, primarily to shield individuals from liability.The individuals who own and work for corporations already have free speech rights. The Supreme Court’s interpretation effectively grants corporate speakers extra rights both as citizens and as corporations. Corporations were created by the government—why can they not be regulated by the government? One day after Republicans win back one Senate seat, Democrats as usual are acting like the spineless, pathetic losers they been for most of the past 30 years. They now claim that their signature issue, health care reform, can no longer pass Congress. I am embarrassed to be a Democrat, not because we lost an election but because, in the aftermath, they are proving they lack the courage of their convictions. Look. When Obama was inaugurated there were 58 Democrats in the Senate and 257 Democrats in the House. Once Scott Brown is sworn in there will be 59 Senate Democrats and 256 Democrats in the House. We are better off now than we were throughout most of Obama’s first year. This Congress has already passed the stimulus package, regulations on credit card and tobacco companies, the Lilly Ledbetter Fair Pay Act, and SCHIP with fewer Democrats than they have now. Pass the damn Senate version of the bill, fix the flaws in the budget reconciliation process (which cannot be filibustered by the Republicans) and move on. This is like Washington was when I got there five years ago. You know, the Democrats really weren’t sure they were Democrats. If you want to win, you actually can’t sort of move to the middle and become a Republican. You’ve got to stand up and stand for the things that you got elected on and that the Democratic Party believes in and we haven’t seen that in the healthcare bill and I think that’s part of the problem. Try to show some leadership for once. This being San Diego, the land of Comic-Con, I thought it might be interesting to look at some recent philosophically-minded comic books. I intend this initially as a three-part series, but we shall see how far I actually get. I want to begin by looking at a fairly obvious choice for this: Apostolos Doxiadis’s and Christos H. Papadimitriou’s (with Alecos Papadatis and Annie di Donna on art) Logicomix: An Epic Search for Truth. This 300-page graphic novel with an extensive appendix tells the story of Bertrand Russell and his quest for a firm foundation for mathematics and logic. In the process, the story covers every major logician and mathematician and their ideas of the first half of the 20th Century (including, but not limited to: George Boole, Georg Cantor, Gottlob Frege, Kurt Gödel, David Hilbert, Giuseppe Piano, Henri Poincare, Alan Turing, John Von Neumann, Alfred North Whitehead, and Ludwig Wittgenstein). In addition, the story also cuts to the creators themselves (and Doxiadis’s dog Manga, whom, we are informed in a footnote, is not named after the Japanese comic form) as they wander through Athens and discuss the creation of the graphic novel. This latter storyline is not a post-modern conceit but is, instead, as the authors themselves reveal, an exploration of the notion of self-reference without which any discussion of 20th Century logic is incomplete. Being somewhat familiar with the story covered in this work thanks to an excellent year-long class I took from Penelope Maddy my first year in graduate school, the authors do a good job covering the ideas and issues Russell and others struggled with in their quest to find a secure and uncontroversial foundation for mathematical (and by extension) logical truths. However, as we learn from the authors themselves, these philosophical ideas are secondary to the story of the individuals and personalities (primarily Russell) who engaged in these investigations. It is this aspect of the story in which the book really excels as the creators are able to give one a real sense of the concerns and motivations and obsessions that propel the protagonists on their quest, in many cases to the exclusion of everything else, as well as the profound disappointments (and in at least one case ecstatic joy) when it is proven that the goals of said quest are unobtainable. The authors, perhaps, try to psychologize this quest a bit too much by explaining the various philosophical ideas as an extension of biographical details of the philosophers, but it is certainly the case that a surprisingly large number of the major thinkers who explored these issue were ultimately driven insane (or perhaps it was a certain predisposition to insanity that led and enabled these individuals to take up these issues in the first place. That, at least, seems to be the conclusion of the authors). My one major complaint about this otherwise excellent and fascinating work is that the authors do not exploit the medium of the graphic novel as effectively as they could in explaining some of the more significant logical and mathematical ideas. One thing I really remember from the aforementioned class with Professor Maddy was her ability to graphically explain many of the more difficult and abstract logico-mathematical concepts. As just one example, I still vividly remember how she was able to graphically explain the idea that some infinitely large sets can be larger or smaller than other infinitely large sets. In many respects I think it was a missed opportunity on the part of the creators to not exploit the graphic medium to explain things like infinities or Turing machines. In the creators defense, this work is not intended as a logic for dummies text, or even a history of ideas, but instead an examination of characters and personalities. 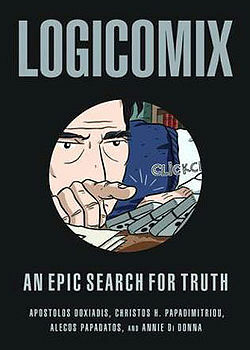 In this respect Logicomix succeeds admirably, and I highly recommend this fascinating work.